It is important to realise when buying a monitor, or any display device for that matter, that the accurate reproduction of colours is not always achievable. Without your display, printer and camera working to the same colour profile you may well find that images look different across different equipment; with varying colours and tone, and sometimes an inaccurate representation of what you are really trying to display. The accuracy of colours can vary greatly from one monitor to the next, and depends on panels used, their technology, the additional components, and factory settings as well as individual graphics cards and how they are set up. As such, apart from monitors designed for critical colour work, it can be quite hard to really set up a screen to display accurate colours. Various software packages exist which can help you calibrate a screen, but mostly serve only to get the screen looking at a comfortable level for the user based on their preferences. These packages are most useful for helping you set the brightness, contrast and gamma levels of the screen however which are important for ensuring comfortable working conditions. It's easy enough to get a screen looking how you would like it to, and many users are not bothered about sacrificing colour accuracy for vibrancy. This particular trend is evident in the way monitors are provided to the main stream home market, often with vibrant colour presets and sometimes even with technologies like Sony's X-Black and NEC's OptiClear which help bring out vibrancy without concern for the accuracy of the colours displayed. Most average users however would rather have more vibrant colours in practice and it can make the screen look more pleasing to the eye for gaming and movies for instance. However, if you want to carry out any colour work or use Photoshop and ensure a good level of colour reproduction, you'll have to consider setting up your monitor properly. 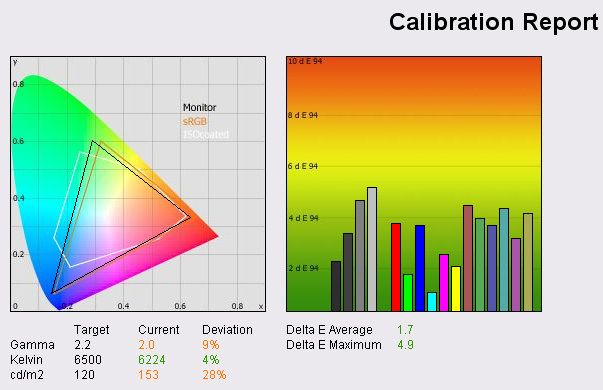 Thankfully there are instruments on the market which can help you do just this, which will guide you through setting up your monitor to ensure colour accuracy, as well as show you how the monitor performs before and after calibration. 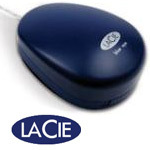 The LaCie Blue Eye Pro is one such device, and being based on a hardware tool from Gretag Macbeth, is considered one of the better devices available. LaCie have combined the Gretag colorimeter device with their own software suite which is easy to use and offers some interesting pre and post calibration analysis. Unfortunately these devices don't come cheap, with the LaCie retailing at ~£250 in the UK. This means they are out of reach for most average users, and while there are some more budget colorimeters available (Spyder 2 for instance at ~£60), they can't match the performance of the Gretag hardware devices. The LaCie Blue Eye Pro comes packaged as shown above with software installation CD, the Gretag hardware colorimeter device, a protector clip / ambient light measurement attachment, counterweight and instruction manual. The software is easily installed and intuitive to use. The actual device itself is reasonably sized and plugs into your computers USB port. The counterweight ensures you can hang it from the top of your screen comfortable during calibration and there are small suction cups on the bottom of the device if you have a screen (CRT mostly) where you can attach it to the screen firmly. showing the suction cups for attachment to hard coated screens and CRT's. I installed LaCie's software suite and followed through the PDF manual provided on the CD. I decided to first of all analyse several monitors I had with me in my testing environment to establish accuracy of the produced colours as they were set up at present. I was particularly interested to see the results from my main TFT screen, the Dell 2405FPW, as this was already set up to my liking based on software tools and my perception of the screen. The other screens tested were the NEC LCD20WGX2 and Samsung SM205BW which were both restored to default factory settings along with my graphics card. Before you use the software for the calibration process or testing, it is necessary to preset a number of options which you are aspiring to with the display. It involves first of all identifying which values you are aiming for with gamma, colour temperature and luminance. Gamma of 2.2 (default for computer monitors), colour temperature of 6500k (daylight) and luminance of 120 cd/m2 (recommended for LCD screens in normal lighting conditions) are preferable in most cases and you can preset these within the software in the "settings" section. Your subsequent calibration steps will then aim towards these as values where applicable and testing assumes these are the target values you are looking to reach. This Test and Report feature is a good way to immediately measure colour accuracy of a monitor out of the box on its default settings. The report also shows the maximum DeltaE value across the range (in this case DeltaE Max = 4.9), as well as an average DeltaE (1.7 in this case). 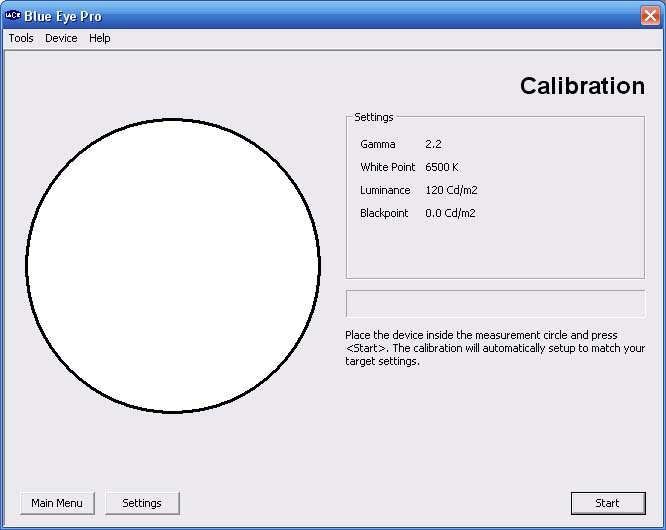 Since most users don't have access to hardware calibration tools like this, the results are a good indication of the accuracy they can expect from the screen. Even with software and some manual adjustments, you are unlikely to get much improvement in overall accuracy. This will become a part of my monitor reviews for TFT Central, with out of the box colours analysed to show how reliable they are for each monitor looked at. The section on the left of the above report shows the colour gamut space with a triangle featured to represent most importantly the monitors colour range (black triangle) as compared with the sRGB standard space (orange triangle). In order to understand this element of the report you need to realise that the nearer the triangles are to the corners for green, blue and red; the better. This particular test above shows the monitor is capable of exceeding the sRGB gamut space in terms of green and red, but not quite in blue tones. The current and desired values are listed for gamma, colour temperature and luminance, and are compared with the aid of a percentage difference. There is an option to 'save' the report as well, and within here there is also the quite handy reading of the monitors black point. This can then be used in conjunction with the luminance value to calculate the current contrast ratio. Reports can be saved as PDF, HTML or text, or a simple screen capture can save the above image if you'd rather. The calibration process is quite easy to follow and only takes 5-10 minutes. It involves adjusting your monitors OSD settings for brightness, contrast and red/green/blue (RGB) where these are all available. At the end, an automatic calibration process lasts for a couple of minutes and creates an ICC (International Color Consortium) profile which can be saved and used with your hardware configuration. The whole process is pretty intuitive to follow, especially after a couple of times through. 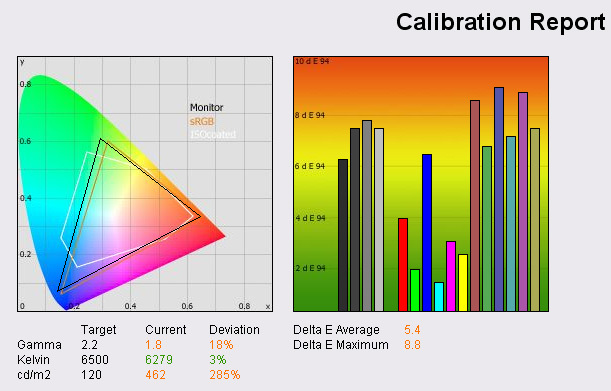 After the calibration is complete and you're using your newly configured ICC profile, you can then run "Test and Report" again to measure colour gamut and DeltaE again. Hopefully this time the results are more desirable, with an improved gamut range and lower values on the DeltaE graph. Some examples of the improvements are shown below. Measuring the 20WGX2 out of the box gave the above results from the LaCie Blue-Eye software. The monitor was factory reset along with a default graphics card profile and measured after a suitable warm up period of >1 hour. As you can see from the analysis above, the main issue was the excessive brightness at default setting, with the OSD selection defaulting to 100%. Colour accuracy was not up to scratch really, with average DeltaE being 5.4. Black point was measured at 0.8 cd/m2 (not seen here but available in the saved PDF report), giving a usable contrast ratio of 578:1. Note: these measurements were taken without Advanced DVM being active. The gamut was actually pretty good, reaching outside the standard RGB range except in the blue tones. Default gamma and colour temperature were not quite up to the desired standards of 2.2 and 6500k respectively. After the screen was calibrated using the LaCie Blue-Eye Pro, the results were far more impressive. DeltaE was and average of 0.5, a very impressive result with colour fidelity being classed as excellent across nearly all the colour range. The darker tones were the only ones which showed a little more variation from the desired tone, an indication of the difficulty that S-IPS can sometimes exhibit in it's technology. Again this was reflected in the black depth which was measured at 0.3 cd/m2 which can't match that of modern VA panel variants. Contrast ratio at these settings was recorded at 390:1, again Advanced DVM was left off. Colour gamut as a little improved and gamma, colour temperature and luminance had reached desired levels. Out of the box the Dell 2405FPW actually offers some half decent colour accuracy and gamma, colour temp and luminance are all pretty decent. After calibration the results were again improved, with a very impressive DeltaE reflecting good colour accuracy. Luminance, gamma and temperature had also again been fine tuned to suit the target presets. In this instance I had decided to go for a luminance of 170 cd/m2 to meet my personal requirements and room lighting conditions. Black depth was recorded at 0.3 cd/m2, but reached 0.2 cd/m2 when calibrated at 120 cd/m2 luminance. This gave working contrast ratios of 593:1 and 600:1 respectively. Not very impressive in terms of colour accuracy, but then this is a much lower priced model, and uses TN Film panel technology. Accuracy was poor across the range and brightness was too high by default settings. Again this model comes set at 100% brightness in the OSD, far too much for average and typical use. Black depth was recorded in the saved PDF results as 0.4 cd/m2. However, an impressive result after calibration, showing that modern TN Film panels are certainly capable of providing accurate colours with the right settings and configuration. Sadly unless you have a hardware colorimeter such as this device, you are unlikely to see such results and will need to make do with the limited default settings on the most part. Gamma and colour temperature were well matched with their targets, but luminance became a little more varied. However, brightness is reasonably easy to adjust to meet your requirements. Black depth was recorded at an impressive (for TN Film) 0.2 cd/m2 giving a usable contrast ratio of 545:1 in this calibration. I was impressed with the ease of use of the LaCie Blue Eye Pro and its software. The device itself is sturdy and well built and serves its function well. I have faith in its performance as Gretag are known for making excellent colorimeter devices and the LaCie package is well regarded across pro review sites. 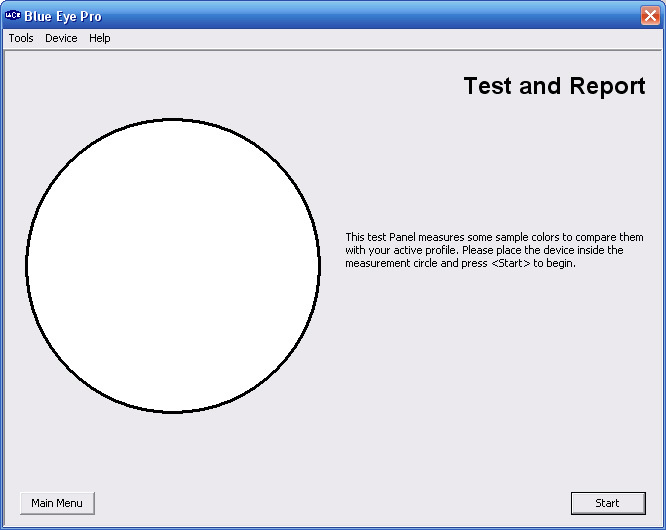 The software was easy to use and provided a nice graphical representation of performance before and after calibration. I think this is some of the easiest software to follow from a readers point of view as well, with DeltaE graphs being particularly easy to refer to and compare between models. These tests will feature in all my reviews for TFT Central and I hope to provide a good analysis of the monitors performance as measured by the device. I will also look at other software packages provided by Gretag and BasicColor in the near future to compare their use and functionality with LaCie's suite.